Is it bad to say that making a clamshell quilt wasn't on my list? Not that I didn't love them. I was definitely intrigued by them, and when daughter dear made one for grandgirl, I was duly impressed. But I still didn't feel the need to make one myself. That is until Latifah/Latifah Saafir Studios came to town. Oh yeah. I've admired Latifah's work for a long time, briefly been in a bee together, and enjoyed seeing her at QuiltCon 2015. Of course I wanted to take a class with her when she was in town visiting the Seattle Modern Quilt Guild. The workshop I chose was an inaugural presentation of Glam Clam II which offered instructions for several pieced clam variations. With my The Clammy 12" ruler in hand, I chose the Half Baked Clams. And let me say right up front, that Clammy is awesome, and I can't imagine doing this quilt without it. Having a 14" rotating cutting board helped alot too. As I mentioned in a previous post, I had taken a stack of Cotton + Steel prints with me, having used the viewfinder's as my focus fabric when I pulled other prints from my stash. I'm really pleased with my choice, as they make such a colorful and fun quilt! For the backing, I chose Melody Miller's Jacks from her Playful collection, and thankfully, I had plenty for the binding too. Quilting was 1/2" horizontal lines, simple yet striking. One thing Latifah verbally shared at our workshop was a couple of ways to make her signature chunky binding (1" finished). I stumbled my way through on making it for this quilt, and though I need to perfect my technique, I'm super pleased with how it turned out and think it really adds something special to this particular quilt. Finishing at 52"x64", I'm glad to have conquered the clamshell! It has a piecing technique so different from the traditional 'blocks in rows' quilt, and I found it enjoyable and relatively quick. 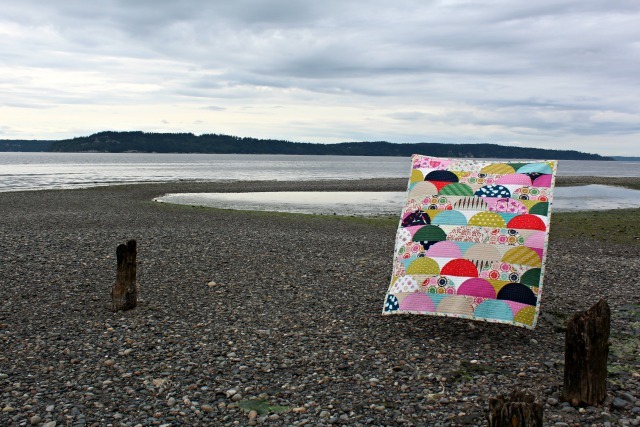 The connection of taking a clamshell quilt to the beach for a photoshoot was lost on me until I was already there, but I must have subconsciously known it would be a good choice. All-around, a pretty satisfying make. This quilt was on my 2016 Q2 Finish-A-Long list! Such a great quilt! I especially like the mixture of solids and prints as the prints really show off well! I have the ruler so now I gave to figure out fabric and work it into the plan. 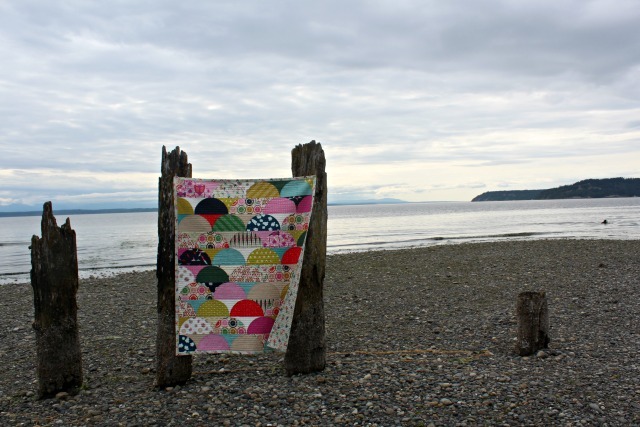 A clamshell quilt at the beach! Oh! It makes sense now! Lol. I think your quilt is absolutely gorgeous. The beach shots are perfect and I love your 1 inch binding. I'm so looking forward to my workshop with her in less than a week. The chunky binding is a great touch on this quilt, especially because of the way the print works that you used. I don't really have a quilting bucket list, personally, and I like how once presented with the opportunity you embraced the option. Beautiful finish! A lovely quilt! Love your colour choices. This is terrific, and when presented with an opportunity to learn from and create with an artist you admire, one should seize that chance. There are sure to be positive things happen, like a half-baked quilt. Gorgeous quilt ! I love your pictures on the beach. 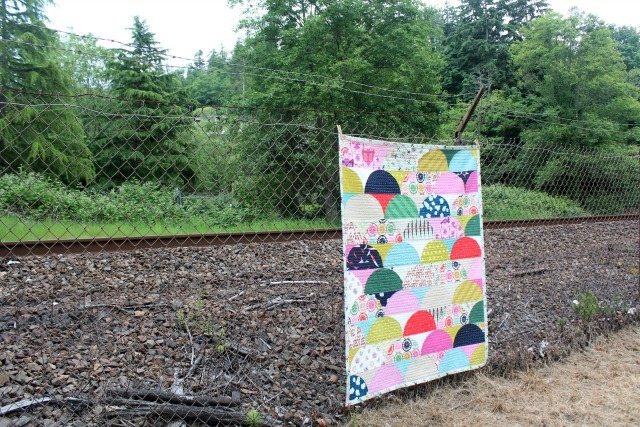 Love how your quilt turned out! Great colors!! I like the wider binding. May be a good choice for those modern quilts with no borders. What a gorgeous quilt! I was reading about this ruler only today! 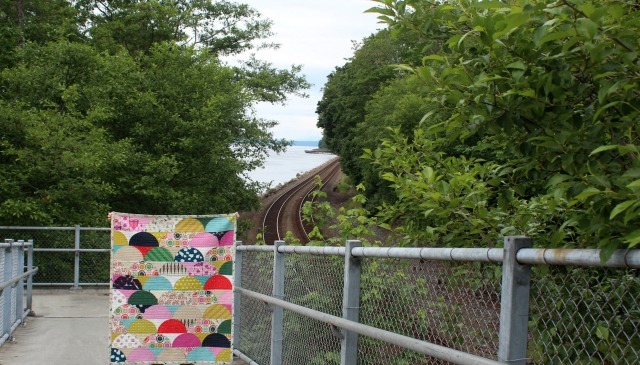 Love the locations you've chosen to photograph your quilt. Love this mix of fabric, and the clamshell pattern is really pretty. Great finish! I love that you were able to learn from the designer, that's fun. 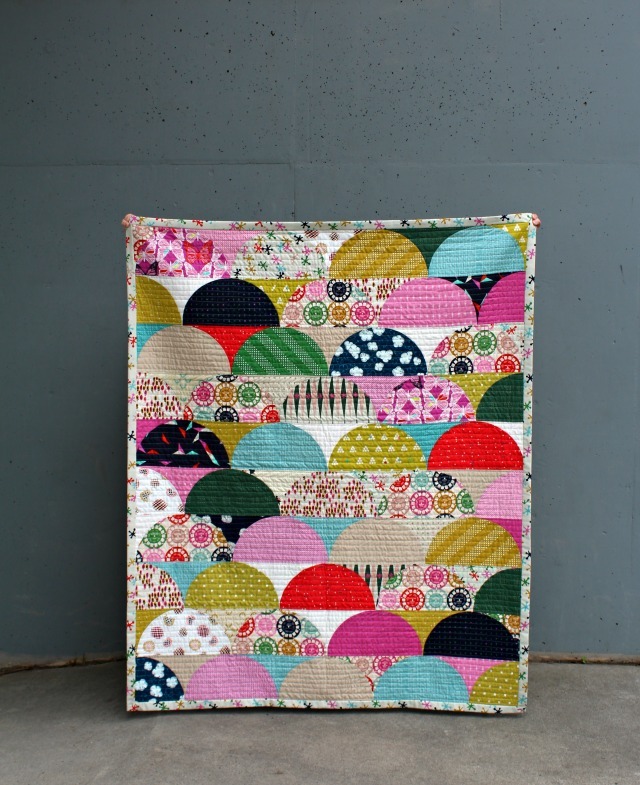 Such a fabulous quilt - the fabrics are just perfect for your clamshells and your photos are amazing!! So, it isn't bad that you didn't feel the urge to make a clam! I admire them, want to make one, but it's low on my list. I actually love the half baked version best...you done good! I love everything about this quilt - the colours are awesome and the piecing makes for such an interesting design. Beautiful pictures too! Great finish! This is such a great quilt Debbie!